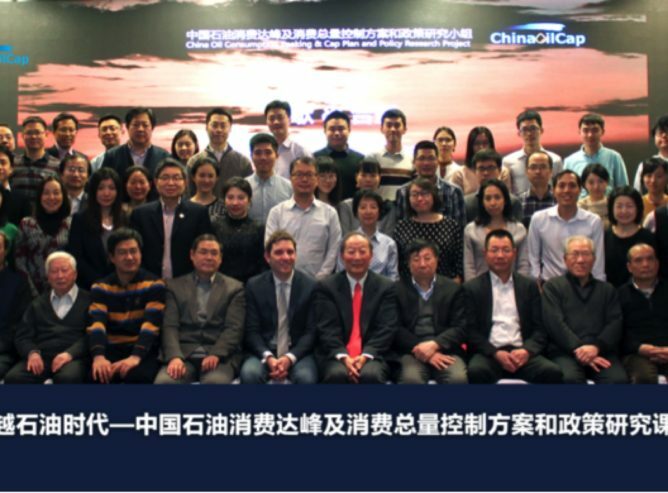 On January 19, 2018, the “China Oil Consumption Peaking and Cap Research Project” was formally kicked off in Beijing, with the support of many organizations. Natural Resources Defense Council (NRDC) and Energy Foundation China (EFC) are coordinating the project. Participating in the project to help push forward China’s low-carbon development are: China Academy of Environmental Planning (under MEP), Energy Research Institute (under NDRC), China Academy of Fiscal Sciences, Zhejiang Center for Climate Change and Low-Carbon Development Cooperation, China Institute of Water Resources of Hydropower Research, Peking University School of Public Health, China Petroleum and Chemical Industry Federation, Sinopec Economics and Development Research Institute, Laurence Berkeley National Energy Laboratory, UC Davis Institute of Transportation Studies, World Resources Institute, Institute of Transportation and Development Policy, Innovation Center for Energy and Transportation, MotionECO, and GoalBlue, along with research and policy steering committees. In attendance at the kickoff meeting were over 60 representatives of NGOs and energy and environment experts, as well as members of the steering committees. Yang Fuqiang, Climate Breakthrough Awardee and Senior Adviser with NRDC, introduced the framework of the oil cap project. He emphasized that the oil cap project research will help to strengthen China’s oil supply security, and make China’s oil consumption and development more efficient, more green, more low-carbon, and more sustainable, to help China “leap over the age of oil” into the age of clean energy. Oil cap research will be targeted to help achieve goals for resource conservation, environmental and public health, and climate mitigation. The oil cap project’s overarching aim is to put forward a plan and pathway for the early peaking and reduction of China’s oil consumption (over the 2016-2050 timeframe). This will ensure that China’s CO2 emissions will peak before 2020, putting the world on track to achieve the 2 degree climate target.